When choosing the right theme for your restaurant website, you want to make sure you are dealing with a professional developer that provides you with high quality. It’s no easy task finding such developers nowadays, with the market being so overwhelmed. Professional WordPress restaurant themes can be found at several developers only, and one of them is HotThemes. These themes let you create your website fast and easy, without having to pay extra cash to web designers to help you with it. 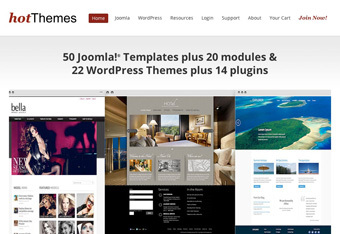 They offer plenty of quality themes with many great plugins to go with. In case you are a Joomla fan, this developer offers a wide range of Joomla restaurant templates as well so you can freely run through them and choose your favorite one. All of these templates, Joomla and WordPress, have flexible layouts that can be modified in many ways. The templates parameters page is very easy to use and it allows you endless customization possibilities with unlimited color styles so you can easily create your own unique website by tweaking the themes all by yourself. HotThemes feature the HotStart installer for each theme, and it allows you to create a CMS website in few minutes. You will no longer have to spend hours by the computer figuring stuff out, or pay web designers to help you out. Having the ability to run and maintain your own website is a big money and time saver. All of the products created by HotThemes are 100% GNU/GPL compliant, and you will be allowed to rebrand and install them on unlimited number of domains. These guys take care of their products over time, you won’t just get a final product that never changes or improves. For buying single products, you automatically get lifetime updates for the theme you’ve purchased.